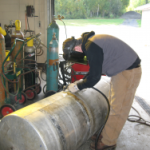 A significant shortage of workers currently exists in the field of welding, which translates into ample job opportunities and excellent salaries for those considering welding as a career. It has been said that welding is a skill that is not complex to learn, but is like an art form that can be challenging to master. 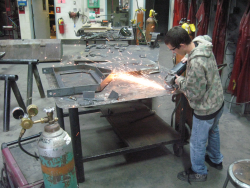 Students at the St. John Valley Technology Center are given training in basic welding techniques and positions, as well as an opportunity to practice perfecting their newly acquired skills. Students also learn how to work with various types of metals and electrode sizes. Students initially work on test plates and other practice material, then eventually move-up to “live work” projects brought to us by actual customers. The welding lab at the St. John Valley Technology Center contains equipment that represents the latest technologies found in industry. We pride ourselves on keeping our equipment current so that we can give our students the best preparation for the future possible. 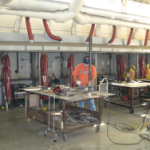 Completing both years of the welding program gives students the instruction necessary to successfully take and pass the American Welding Society’s Limited Base Metal Thickness Plate Test – a credential sought after by employers. Graduates of SJVTC’s two-year welding program earn 3 credits toward the welding program at Southern Maine Community College.